Activists demand detainees’ release, closure of the prison and base. Photo by Witness Against Torture. 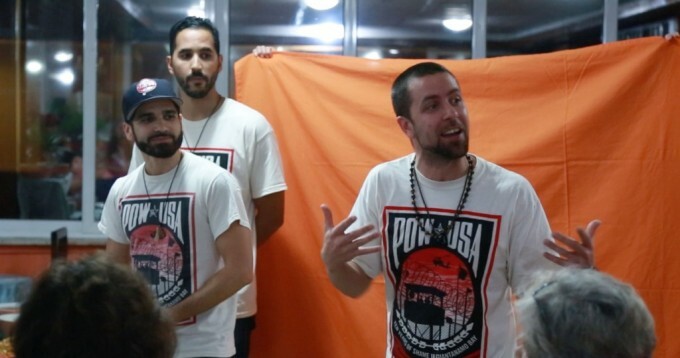 As people in the United States enjoyed Thanksgiving with their families, 14 human rights activists with Witness Against Torture were in Cuba protesting the ongoing operation of the US prison at Guantanamo Bay. At an encampment outside the base, the delegation demands that the prison close and that it not simply be moved to North America by holding men without charge or trial in federal prisons. The group returns November 30 from Guantanamo to Havana, where it will request a meeting with the US ambassador. On Thanksgiving Day, the delegation held a vigil outside the base under the banner “Forced-Feeding, Not Feasting at Guantanamo.” The vigil highlighted the continued forced-feeding of hunger striking prisoners, as well as the separation of the detained men from their families. The US activists are fasting in solidarity with the prisoners.